Hindsight is 20/20: Looking back on God’s providence over the long history of CEH. The LORD your God has blessed you in all the work of your hands. God has watched over your journey through this vast wilderness. These forty years the LORD your God has been with you, and you have not lacked anything (Deut 2:7). Sunday, July 8 was a day of much celebration. Not only did we start the morning by kicking off our July “Mission of the Month” of Habitat for Humanity Grand County, but the President of HFHGC, Steve Morrison, attended to present Bud Crawford the very first “Habitat Hero Award” for efforts above and beyond the ordinary volunteer. CEH’s efforts in HFH for Grand County are just one way we can look back and celebrate our wonderful past. Celebrating our past and seeing how God has guided CEH since 1905 is the first step we will take as we begin to look forward. Like the children of Israel, who wandered in the wilderness for 40 years before settling in the Promised Land, God has guided and provided for CEH through some very lean times. God also provided CEH with vision: first for a missionary church to be located far away in Granby, CO (in 1939. . . before there was a highway 40 or any convenient way to get from Fraser to Granby); and then for the two churches to be united in one space in 2002. Both efforts seemed to be miraculous by any stretch of the imagination. Indeed, it’s so rare for two congregations to be combined so successfully that the story of CEH and how they “Weaved” themselves together into one congregation is featured in a textbook on how to do church right! One thing that has made a difference in CEH’s history has been the nature of the congregation. From the first building (the historic Fraser Church, dedicated in 1911 after congregants gathered river rock and worked together to build the little church) to the current beautiful site in Tabernash, the hands of the congregants have worked together to vision, plan, and build the church buildings. Bud Crawford will be quick to point out that in the working together, relationships are built and strengthened as well. Which is probably why “Relational Ministry” ranked so high in what CEH is good at when we pulled our New Beginnings information together. A bit over a year ago we set out as a congregation to begin to look forward. For help, our Presbytery of Denver sponsored our participation in the New Hope “New Beginnings” Process. This process began with an assessment by an outside consultant, who came in to see the building and listen to people talk about the church and what is important to them. After the initial visit, we were issued a report and moved onto the second phase where we grouped ourselves into “House Groups” and met five times over the next two or three months. After the House Groups met, all their data was collected and processed by our Transition Team, headed up by Elder Matt Nixon. Our New Beginnings process informed us that once people have walked through our doors, they feel loved and included. The relational aspect of CEH is so strong that it brings people back to the church for worship and fellowship long after they have moved away from the county. What a wonderful thing to celebrate as we look over the history of our congregation. What a wonderful thing to keep as a focus as we look into the near future for where God is leading us! Looking back, we can certainly see God’s loving hand guiding us through a tremendous history. There are many sources available to you if you’re interested in reading our history. There are pictures and paintings with narratives in our foyer, and a new print out of the history is available on the old Communion Table under the pictures. You can also check our website for an abbreviated version of the history. Our hope in the next several weeks is that we can see God’s hand in our future vision as well. Proverbs 29:18 reminds us that “Without a vision, God’s people will perish.” Let’s tune in and listen for God’s direction, as we seek to move into God’s future for CEH. Wouldn’t it be great if we had the faith and assurance of David marching into the field of battle with nothing but five smooth stones he had chosen from the wadi and the slingshot he always carried with him? We recognize the chaos/storm and. . . Panic! Try to handle it ourselves (I imagine the first response of the disciples was to begin to bail out the boat; they were career fishermen weren’t they?). We are filled with awe when things work out — we find ourselves surprised that God has been with us in the boat all along. Jesus asked the disciples, “Why are you afraid?” We could ask ourselves the same thing, “Why are we afraid?” Of course an easy answer would be: LIFE. We’re afraid because real life — death — disease — illness — crime — violence — real life stuff rains down on us all the time. It’s been a long time for most of us to be able to rush into battle our giants with only those things God has prepared us with. David’s confidence in God is stunning; the disciples’ doubt is so much more realistic. But when Saul placed upon David the heavy armor (built not for a child but for King Saul), David realized God had already prepared him through years of picking up rocks, aiming them in his slingshot just right, and then letting fly the blessed and chosen stone. Had he walked into the battle with that heavy armor on, he certainly would have perished: his faith would have been in the sword rather than in God. And then let fly your blessed and chosen stone with assurance. God may be ineffable, but as the church we need to become the visible Jesus to the world. The Trinity is hard for us to understand, right? Let’s think about it as if we are blowing bubbles. There is the wand, which represents our Creator who forms us and shapes us. The liquid is “Emmanuel” or the visible “God-with-us”; the skin that God put on Godself to be visible in the world through Jesus. The air we blow through the wand into the liquid is the Holy Spirit, the breath of God that moves and fills us and enables us to become what we are called to be. It’s a silly metaphor maybe (and God knows the world doesn’t need another silly or faulty metaphor for the trinity), but what I really wanted to highlight is that you can have a bubble and it’s all good and well, but what really makes the bubble wonderful and beautiful is when the light is reflected in the liquid. It makes an iridescent reflection that is vibrant and visible (like the light of Jesus that shines out of our lives). If we are just mere humans and didn’t reflect any of God’s love for the world, this world would have no visible Jesus. See how that works? It all really relates to how well we show the beauty of the love of God to the world. It’s our job; we are the post-resurrection Body of Christ that is visible to the world. And what I’ve been noticing lately is that somehow that light isn’t shining brightly enough. Someone shared a statistic with me today that 22 veterans complete suicide daily. That’s an epidemic. It’s emphasized in the media any time someone famous completes suicide. People talk about it around the dinner table, and around the water cooler at work, and there are numerous opinions available on social media and radio and television talk shows. Maybe the one place that can really do something about it, and the one place where we rarely bring it up is church! For we know that if the earthly tent we live in is destroyed, we have a building from God, a house not made with hands, eternal in the heavens (2 Corinthians 4:16-5:1). Don’t you just love that? “So we do not lose hope,” and “slight momentary affliction” are wonderful reminders to me that we live not for a temporary promise but for an eternal promise. I can honestly say I don’t know what that eternity looks like or when we actually arrive there on the life-death continuum. But I’m banking my whole life on some kind of eternity that’s better than this. An eternity where we are not so painfully far from our Creator. So “I do not lose heart.” And I hope that we can inspire each other to reflect more light so that others may not be so inclined to lose heart. May you find yourself reflecting the light of our savior, helping to add some beauty and whimsical love to this world in much the same way that Jesus did as he healed the broken hearted, and drew the outcasts back into community. For we do not proclaim ourselves; we proclaim Jesus Christ as Lord and ourselves as your slaves for Jesus’ sake. For it is the God who said, “Let light shine out of darkness,” who has shone in our hearts to give the light of the knowledge of the glory of God in the face of Jesus Christ. But we have this treasure in clay jars, so that it may be made clear that this extraordinary power belongs to God and does not come from us. We are afflicted in every way, but not crushed; perplexed, but not driven to despair; persecuted, but not forsaken; struck down, but not destroyed; always carrying in the body the death of Jesus, so that the life of Jesus may also be made visible in our bodies. For while we live, we are always being given up to death for Jesus’ sake, so that the life of Jesus may be made visible in our mortal flesh. So death is at work in us, but life in you. So yeah — we are supposed to be the visible Jesus to one another. Even in our hurting. That’s the hard part, isn’t it? Letting others care for us and to be vulnerable to them, but when we remember it is part of our calling to one another, it’s a little easier to open up and share. Because if we don’t, we are denying others of seeing and being Christ. Apparently though, it was difficult for those who lived and walked with Jesus to actually see the light. Those who were vulnerable to him, of course, recognized him immediately as pure, living love. But there were so many who were absolutely closed to Jesus, and it pained him that their hearts were so hardened. Our Gospel reading from Mark 2:23-3:6 offers two examples of some people with some pretty hardened hearts. They were obedient followers of the Torah and keepers of the law, but in their strictness and passion to follow the letter of the law, they lost the Spirit of the law. Again Jesus entered the synagogue, and a man was there who had a withered hand. The Pharisees watched him to see whether he would cure the man with the withered hand on the sabbath, so that they might accuse him. And Jesus said to the man who had the withered hand, “Come forward.” Then he said to the Pharisees, “Is it lawful to do good or to do harm on the sabbath, to save life or to kill?” But they were silent. He looked around at them with anger; he was grieved at their hardness of heart and said to the man, “Stretch out your hand.” The man stretched it out, and his hand was restored. The Pharisees went out and immediately conspired with the Herodians against Jesus, how to destroy him. Jesus saw suffering — whether in the hunger of the disciples or in the pain of the man with the withered hand — and he chose to be present to their suffering and heal them. Early last week when I had already begun studying these two lectionary readings for preaching them on Sunday, I also took some time to listen to one of my favorite podcasts. Oprah Winfrey’s “Super Soul Sunday” podcast features interviews with famous people who will share openly about their faith. The one I listened to was called, “How to Listen With Compassion” with Buddhist Monk Thich Nhat Hanh. I listened and was really intrigued. In fact, I listened to it again as soon as I finished it the first time. Wow! I had never considered those passages to be so closely parallel to the practice of “being present.” I listened to the podcast again and decided, upon conferring with God in my morning meditations, that I would give the day to being present. My schedule was full and I was a little anxious about accomplishing everything, but I agreed to an attempt at practicing being present. Have you ever noticed that when you pay attention to things like this there are opportunities EVERYWHERE around you? My day started with preschool chapel and the children seemed extra loving and excited about chapel time. They sang at the top of their lungs and shared such enthusiasm for the love of God that I found myself on sacred ground with them. Great way to start the day with huge rewards for being present! Then I received a call from a couple from Texas. They wanted to elope. They had a big ceremony planned for November but wanted God’s blessing on their marriage and wondered if I would do the service. Today. As soon as they could drive over. And then I caught myself. What was I learning about being present? Could I challenge myself to be THIS present? I pondered what the couple was asking for — a blessing from God. Could I meet them in their suffering and be present to what they needed? Could I somehow serve as the visible Jesus to them in their need? I stilled my mind and prayed and before I knew it I had invited them to come over for some brief counseling before we did a short service in the forest. When I blessed their rings and helped them exchange their vows of love and commitment, I found myself on sacred ground again. The light dappling through the pine trees, the backdrop of the Continental Divide, the fresh smell of our Colorado summer: all of this would have been missed if I had let my inner Pharisee take over. The joy in their eyes as they walked through the rest of the forest hand in hand, officially married before God and all of Creation – this would not have filled my day at all. And though my day was busy, it ended up being such a productive and blessed day. I recognized that sometimes the inner Pharisee needs to be quieted so that I can be the visible Jesus as well. I need to remember that my old clay pot needs to let God’s love and light shine through even when it means I’m not following procedure and obeying polity. Isn’t that what Jesus was teaching through his healing of the man with the withered hand on the holy Sabbath? May all of you find a way to become more present to others as we move through this beautiful and wondrous life. And in your presence, may you also bring the gift of a visible Jesus to a world that needs his presence, love, and grace more than ever. Ineffable. That’s the best word I know to try and put words to the presence or identity or relationship of God to God’s people. “Ineffable” means that words just won’t do, that what one is trying to describe is beyond words. Ineffable seems like a strange way to define God, but all our attempts to describe Her fall utterly short of the holy mystery. Even the name “God” is just more of a description. I like the description “Divine Other” instead: He/She is something so much bigger and “other” than us, so holy and divine, we can’t even capture it in words. The concept of the Holy Trinity is also just another attempt to describe God. It’s a completely human construction that has caused divisions and arguments within the church for as long as we have attempted to find words to express our common belief in God as Christians. But every first Sunday after Pentecost, we celebrate “Holy Trinity Sunday.” It is the only Sunday of the Liturgical year that focuses on doctrine. Because remember — the Trinity is doctrine; it isn’t a scriptural truth — it is derived from scripture. It is human’s best attempt to describe something ineffable, remember? In my recent trip to Greece I took immense joy in studying the icons at the monasteries and Basilicas found in every city and village and upon every island we visited. 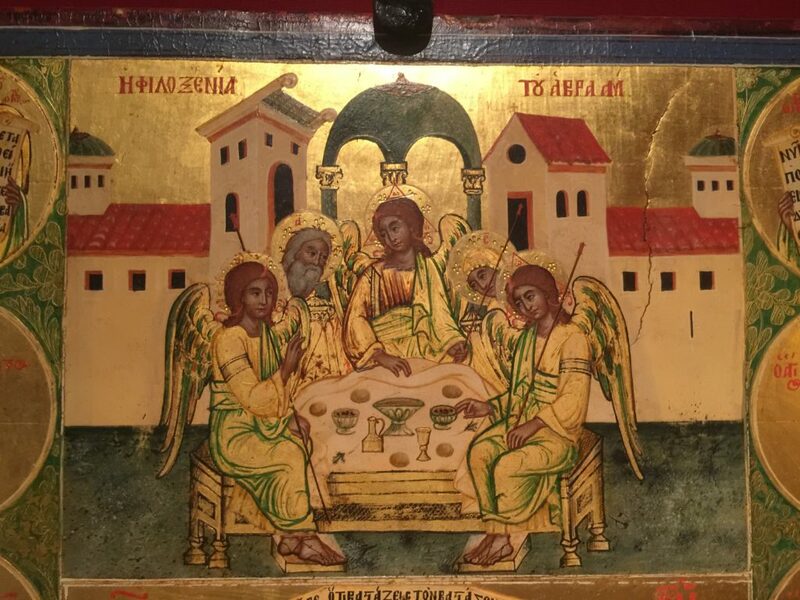 On the beautiful island of Hydra, I found a little Trinity icon (see below) tucked away in a dark corner. I looked closely and noticed that it was entitled “The Hospitality of Abraham.” Many times I’ve seen the Trinity pictured at Abraham’s table; but this was the only one I had noticed that had Abraham and Sarah in the picture. Take a close look at this icon. Do you notice that the three strangers who sought hospitality from Abraham are seated at the table, in the shape of a triangle. They are all looking to each other. But Abe and Sarah are on the outside of that triangle, just peeking in! It’s as if they are trying to get a glimpse of this holy gathering. Creator/Father/YHWH — we learn about God the Creator as we interact with creation and come to understand some of the Holy Mystery through the patterns and re-creating life we see in nature. We recognize how richly God has provided for us through the cycles of the seasons. We witness inconceivable beauty from the tops of the mountains and even in the most barren places of the Great Plains. God revealed Godself as YHWH in the Hebrew Scriptures, when humankind received the law and the Torah, and learned how to be in Covenant with the Divine Other. This YHWH was powerful and awe-inspiring and the glory shekinah; distant, dangerous, and so Holy one could not even look upon God. Sustainer/Holy Spirit/Advocate— we learn about God the Holy Spirit through every movement and interaction and feeling we experience. God the Spirit is our direct link to the Divine Other, communicating for us even when we don’t have words to express our pain. Spirit is the very breath Creator breathed into us and we are reminded of it each time we take a long, deep breath and fill our lungs with the life-giving mixture of air that Creator provides. Spirit is the goosebumps and warm and cozy feelings we receive as well as the incredible sense that we are not alone. It is the Love that binds us together in unity when we are singing hymns or speaking liturgy, gathered together in prayer, sitting in silence together. God the Holy Spirit surrounds us and changes the everyday ordinary into the sacred. The three persons of the Trinity — Creator, Redeemer, Sustainer — are how we know and relate to God. As Christians we think Jesus is the part of the trinity we understand the best, but it is the part where we fall the shortest. We are called to be the presence of God to others by modeling the love of Emmanuel. But there’s a lot of hurting and broken people out there who are just waiting for Jesus to look them in the eyes and ask, “Are you okay?” Guess what? That’s YOU who needs to be looking people in the eyes so that you can see Jesus in them and you can be Jesus to them. The Spirit moved me to share the following testimony yesterday with Paula regarding three fathers who served their country during wartime and also had a significant impact on my life. She asked me to share this testimony with you today. As Memorial Day approaches this coming Monday, I am so thankful for the roles which three fathers played in my evolution as a born-again Christian. For all three of these men, their Christian faith played a key role in their lives and their ability to serve their country in combat when it counted most. The first is my father, Warden Gaskins, who was raised Methodist in North Carolina and enlisted in the submarine service the day after Pearl Harbor. He served as an officer on attack submarines in the western and northern Pacific for the entire duration of WWII, earning the bronze star for actions taken during combat patrols. Dad’s Christian faith was a bedrock in his entire life, sustaining him through the death of his father at age 12 and through the seemingly endless years of WWII. He was very involved in our local Methodist church while I was growing up, which provided the initial foundation for my own early Christian faith. This same faith sustained and nourished Dad as he cared for my mother who had Parkinson’s disease for many years later in life, and then after her passing, as he lived out the remainder of his life without her. The second is my ex-father in law, Bill Mason, whom I grew extremely close to during my marriage to my son Billy’s mom. Bill served as a soldier in the 10th Mountain Division during WWII in Europe. He fought in the battles for Riva Ridge and Mount Belvedere in early 1945 that proved pivotal to the Allied troops’ ability to defeat of Nazi Germany later that same year. Bill was one of the most modest and caring individuals whom I have every known, and his solid and unwavering Christian faith was his foundation for a life of amazing accomplishment and contribution to others. When I asked him what was most important in his ability to keep his head calm through the savagery of hand-to-hand combat in war, and through other extremely challenging life experiences, Bill’s answer was his absolute faith in Jesus Christ as his Lord and Savior. I was so very honored and humbled to be asked to deliver one of the eulogies at Bill’s memorial service six years ago when he left us to be with Jesus. The third is my deceased wife Joanie’s father, Paul Riley, who I never met, as he was killed in combat in Vietnam in 1967 when Joanie was 11 years old. Paul Riley grew up in extreme poverty in Texas and enlisted in the army upon graduation from high school in 1947. He served multiple combat tours in Korea and Vietnam as an infantry sergeant, and was highly decorated for battlefield bravery in both wars, earning several bronze stars, purple hearts and other commendations. Additionally, three months prior to his death during his second Vietnam deployment, he was awarded the silver star which is our country’s third highest medal for combat gallantry, for his actions in which he single-handedly destroyed enemy combatants and pulled his comrades to safety in the midst of heavy enemy fire, while totally ignoring his own safety. Paul had a very small, well-worn Bible that he always carried in his rucksack during combat missions. He was a Christian man who believed that he was serving God as a soldier by protecting his country and his family from evil. He lived by the words of Jesus inscribed in John 15:13 which are: “Greater love has no one than this, that he lay down his life for his friends.” At a reunion of his surviving comrades from Vietnam that we attended six years ago, they each recounted countless times when he put the words of his faith into action by saving lives on the battlefield. He was a quiet man with immense strength of character, and he was their rock and their calm in the constant storm of jungle warfare. They could clearly see and feel God’s love for them through Paul’s actions. After that reunion, I gave Joanie a pendant inscribed with the words “John 15:13” as a daily memory of her father’s everyday commitment to Christ’s words. After Paul’s death in 1967, the only thing which returned from the battlefield to his family besides his identification dog-tags was his little Bible which had somehow survived the massive land mine explosion targeted for him by the Vietcong. I believe that all three of these men are saints in their own way and are now living in resurrected glory with Jesus. They each demonstrated Christ’s Word through their actions. In other words, they “walked the talk”. And, I am eternally thankful that each was placed in my life by God to provide guidance for my own journey to my born-again Faith in Jesus Christ as my Lord and Savior. I don’t know if there is any better description of what we are gathered here to do today than “Witness to the Resurrection.” It is, of course, what our Presbyterian Book of Common Worship calls a service upon the death of a saint. Today especially, we are here to worship God as we celebrate being the witnesses to the Resurrection of Jesus Christ for a saint who lived his life as a Witness to the Resurrection. Whenever I was asked to officiate at a funeral or memorial service, I would ask if the person to be remembered had a favorite poem or verse, perhaps fastened to the refrigerator or tucked away in their Bible. such a saved verse or quote often revealed something of the one who kept it, and gave me an insight into what was important in that person’s life and which was worth sharing in that service in which he or she was remembered by friends and family. I have two such special momentos in my home. One is a plaque with just a single word carved on it which was made and given to us one Christmas by a very good friend of ours many years ago. It says simply “Faithful.” I don’t know what our friend had in mind when he made the plaque and presented it to us, but “Faithful” is a word that has very special meaning to me, and for many years that plaque has had a prominent place in the very center of the mantel over our fireplace. It is not as important that we be successful in life but that we be faithful. In my life I have felt it important to be faithful to God, faithful to his plan or purpose for my life, faithful to my family, and faithful to those whom I have been called upon to serve. Thanks to a friend, that word, that thought, has had a prominent place in our home and in my life. I’m writing this on our 63rd Anniversary. When Donna and I think of our lives together, truly God has allowed us to share something beautiful together. And for this, we are both most grateful. I was surprised and touched to find out that Donna and Bob had left the scripture selection to me. I thought that certainly, after so many years in the pulpit and after serving so many families at the death of loved ones , certainly Bob had chosen the scriptures to comfort his family and beloved community. And I wrestled with this. I felt a little incompetent to choose the scriptures, and I struggled with what would best comfort all of you in your grief even as we proclaim celebration. But as I walked the ruins of Corinth a couple of weeks ago (remembering all the travels Bob and Donna ventured on) and I sat in a cave on the island of Patmos, I relinquished the struggle and began to listen. And do you know what I heard? Bob’s marvelous, soothing voice, telling me the stories of a life in ministry, carefully recounting the difficult years when our nation struggled with the growth pains of the Civil Rights movement, and detailing the struggle even in our own Presbyterian Church for the Ordination of Women. He always spoke of love for his people through these struggles, understanding that when the Holy Spirit is shaking things up, it can be difficult to do things in a new way. I heard his eloquent words explaining the gift of understanding God in light of science, and remembered countless times when he was able to lift out encouraging scriptures, phrases from great theologians, and quotes from our beautiful Book of Confessions to help explain why we do things, and how we, as a people of God, have come to read and understand scripture. And through all of it, of course his words echoed with love. Of course! He’s still teaching! “No one has greater love than this, to lay down one’s life for one’s friends. You are my friends if you do what I command you. I do not call you servants any longer, because the servant does not know what the master is doing; but I have called you friends, because I have made known to you everything that I have heard from my Father. You did not choose me but I chose you. And I appointed you to go and bear fruit, fruit that will last, so that the Father will give you whatever you ask him in my name. I am giving you these commands so that you may love one another” (selections from John 15, NRSV). The Rev. Dr. Bob Bielenberg was most certainly a friend of God. He lived out Jesus’ commandment through his immense love for Donna and his family, for his love and devotion to congregations across the globe, through bridging relationships with strangers in every place he traveled. God has broken into human life and interrupted it in an unexpected but a glorious way. The Resurrection was the proof of it. . . That which makes life meaningful and exciting is that God constantly breaks in upon human life in his own way, which is not our way. This is our certainty; and it is greater than the sum total of all our doubts. Friends, Bob’s conclusion here is why we can be so assured of our task for today, which is – amidst our doubts and fears and sense of grief and loss – we are here to bear witness to the Resurrection. May it be true in our every word, thought, and deed, and may we bear this to the world in love. In this season of Eastertide we are exploring what it means for us to stretch our “branches” WIDE. No longer will we be content just encouraging our roots to grow deeper and deeper; because of the Risen Christ, we want to begin to stretch ourselves and Share the Story. This week our scripture reading was the Walk to Emmaus from Luke 24, and then the appearance of Jesus to the rest of the disciples that same evening. In this story we notice some of the very same things that happened in John’s gospel: Jesus appears suddenly, defying the natural order of things (walking through locked doors or just appearing in their midst out of nowhere); He says “Peace be with you;” He shows them his hands and feet; He opens their hearts to the scriptures; He commissions them. In John, Jesus breathed the Holy Spirit into them. In Luke, the disciples are reminded that they will be receiving power from on high (and that happens just as promised in the exciting sequel to Luke: Acts). That bears great meaning for us. If it is through the wounds or scars on Jesus’ hands and feet that the disciples come to believe, why is it that we are ashamed of our own? How hard do we try to cover up our wounds and scars so that we appear to be perfect? It’s a problem among Christians. Our failure to share the stories that led to our scars present a dishonest picture of what it means to be Christians, for it is in the healing of these wounds that we become stronger; it is also through these wounds and scars that we can help others come to believe and understand. I was born in a very small village a few miles south of Lincoln NE. in 1928. This is relevant only because it’s been at long life, and when I look back I feel as if I’ve lived 3 full lifetimes. This was just a year before the big stock market crash. I don’t remember the unbelievable changes that came to this country at that time. All I remember about this is that few people that I knew had very much as far as money or worldly goods. But being such a small town we had family and friends, and a community that worked together. But then came the great depression. The thirties were very hard for everyone especially our farmers. I didn’t live on a farm but several of my cousins and many of my schoolmates did. Each year we watched the crops burn up, and suffered so many huge dust storms. In the late thirties many people left for CA. I was raised in a devout Christian family. We had one little church in our town, and it was a Presbyterian church. Most families were of Dutch and German decent. Our school and our church were the hubs of activity for us during my young life. My Mother was a wonderful lady who taught me that God was my Creator and his Son Jesus was my Comforter and Savior, and that I could go to Him and talk to Him about anything that troubled me, and for an answer, as well as to thank Him for all the good things also. I heard all the Bible stories and she made it all so real, that I sincerely believed her. I had a good life growing up but of course I went through many of the unpleasant things that all children and teenagers go through, but I can honestly say that my faith was strong and never wavered through those years because of the strong teachings I received at home, at church and at school. It was later that I really began to be tested. The war years were very different and trying, having to watch so many of my friends go off to war. My mother along with many other women drove to Lincoln every day to work for the war effort in various factories. At the age of 14 I was given many responsibilities that I might not have taken over but for that. I learned to cook to have dinner ready every night when mother and dad came home from a long day. To clean, the way my mother wanted it cleaned, and in the summertime to weed and water the Victory garden my Dad planted. So many things were rationed and we had to adjust the way we lived, but the sacrifices were nothing compared to what the families made with members who were in the military. We prayed fervently for those boys and their families. I graduated high school, in May of 1945 and attended the Univ. of NE that fall. The war had ended in Aug. of that year. I met a young man at the University who had seen serious action in the Navy and had been sent to the University with a V-12 Officers training unit and we married in 1947, after he graduated. He became a geologist and we began a rather long list of moving around the country. I could say that this marriage was one of the biggest mistakes I ever made, except that this union produced two of the most wonderful children I could have ever asked for. Sadly, alcohol took over his life, and even tho’ there were some good times, there were so many bad times. In those years alcoholism wasn’t really acknowledged as a disease, and it was soooo difficult to understand why he did this. I will spare you all the details, but I wondered if I wasn’t being a good enough wife, and I was being told by him how worthless I was and I almost believed it, but I was taught that God made me in His image, and He didn’t think I was worthless. I knew in my heart that God loved us and wanted the best for us. One of the most difficult things was to raise the children in some semblance of normalcy. I thought I could protect them from the reality of the problem, but of course they knew. We lived under the cloud of alcoholism for nearly 20 years. I taught them the things my Mother taught me, and we attended Sunday school and church, and that their prayers were very important. That God would answer in His time. My prayer many times a day was, “Lord please make him stop drinking,” but I was beginning to doubt that it was ever going to happen. Truly, I didn’t doubt that I had heard Gods voice, but suddenly realized what He was telling me. I was being consumed by my desire for my husband to quit drinking and allowing myself to become unhinged. It became so clear that I couldn’t change this man, but I could change myself. I had just been given permission! After my divorce, which my grown children supported, I moved to Denver. I had known Jack Applebee all my life, and he looked me up after getting my number from my Mother, and we started seeing each other, and I knew him to be the kindest, most loving, generous, and well-grounded person I’d ever known, and we’ve been married for 42 years next month. As children we were taught that Thomas wasn’t a very good disciple because he doubted that Jesus was really raised from the dead. Poor Thomas. How would we have reacted in that day and time? We have the Bible; we have students of the Bible who teach us the things that have already happened. But the disciples simply had to live by their early Jewish training, and then the teachings of Jesus. Talk about having to have faith! The important thing is that we overcome those doubts because we know God is there for us and he answers prayer. Not always the way we think he should, but in the way that is best for us. All we have to do is to – LISTEN – for his answer, and Trust and Obey. And listen, if I happened upon my friends who told me they had seen the risen Lord, but were still hiding behind a locked door I would probably be skeptical as well. Because wouldn’t something like that: seeing Jesus, touching his wounds, talking with him, receiving the Holy Spirit from him in a breath of life — would that absolutely transform your life? But there they were. Doing nothing different than they had directly after the crucifixion. I imagine they were sitting around in some kind of a stupor, trying to get a grasp on reality. Why wouldn’t Thomas ask to see for himself? That’s us! We’re the blessed ones. We believe even though we have not seen with our eyes or touched with our hands. Are we still keeping ourselves safe and sound behind closed doors like the disciples? Or have we not only allowed ourselves to believe, but to be transformed and changed and emboldened to go out into the world and start the work of Jesus for ourselves? As we move through the 50 days of Eastertide we are going to challenge ourselves to let go of our fears and doubts about sharing our own encounters with the risen Christ. We’ll start with casual discussion during our worship services and move to talking to our friends and family. The only way we can assure that The Story keeps on going is by actually sharing The Story and sharing how that Story makes a big difference in our lives. The Story has shaped my entire life, and you know what? I’m learning more and more about it through all the good and especially the not-so-perfect saints I have met and loved along the way. I am looking forward to learning more about our Story from you! When the sabbath was over, Mary Magdalene, and Mary the mother of James, and Salome bought spices, so that they might go and anoint him. And very early on the first day of the week, when the sun had risen, they went to the tomb. They had been saying to one another, “Who will roll away the stone for us from the entrance to the tomb?” When they looked up, they saw that the stone, which was very large, had already been rolled back. As they entered the tomb, they saw a young man, dressed in a white robe, sitting on the right side; and they were alarmed. But he said to them, “Do not be alarmed; you are looking for Jesus of Nazareth, who was crucified. He has been raised; he is not here. Look, there is the place they laid him. But go, tell his disciples and Peter that he is going ahead of you to Galilee; there you will see him, just as he told you.” So they went out and fled from the tomb, for terror and amazement had seized them; and they said nothing to anyone, for they were afraid (Mark 16:1-8). On Sunday, April 1, it seemed like it could have been the most elaborate April Fool’s joke of all time. At the very least, the ending of Mark comes across today as the original fake news. Fake because of course the women said something to someone – otherwise we wouldn’t have our story to tell. Our Story with a capital S because it is what gives our life meaning and hope. Our Story: the good news of the empty tomb – is ours to share, like the women inevitably did. And no matter which gospel you read the Story from, in each resurrection account, it is the women who have dutifully headed to the tomb to anoint Jesus’ body for proper burial. It is the women who discover the empty tomb. If you accepted the “Lenten Cup Challenge” it is my hope that you have deepened your faith through Lent by taking personal time for study and meditation and prayer. And even if you only came to worship and listened to the sermon and scriptures throughout Lent I hope that you did deepen your understanding of who you are and how you need to fill your “Cup.” First, get rid of the yucky stuff you carry with you to make room for the good stuff God wants to add. A full cup cannot receive anything. Second, work on filling your spirit (cup) with good and beautiful things; honorable things; the living word of God and fellowship with your brothers and sisters. That might mean cutting down on the social media or constant news stream on the radio or television, so you can make more time for meaningful, face to face relationships. Don’t you want that cup to be full of good stuff so that when your life gets jostled around, it is the “good stuff” that spills out and not the yucky stuff that spills? Together, moving into the glorious, new life of Eastertide, we will look at what it means to take our DEEP faith WIDE. Taking it WIDE means we are no longer looking only within ourselves and nurturing and growing our own faith, but that we are looking up and outward, and learning to share our cup by telling our story and talking about our faith. It’s daunting – it really is. When I think about the women leaving the tomb and telling no one because they were terrified, I think of the way we clam up or get sweaty and nervous when talking to someone who may or may not believe in the same things we believe in. It’s even a sad truth that people have difficulty talking to their pastor about their own personal faith. If the message of Easter tells us anything, it is that good news really can’t be suppressed, though. The movement of the body of Christ moved from the empty tomb throughout the world and is still moving and transforming lives. Jesus is still binding up the brokenhearted and freeing the oppressed. Let’s look up and outward, and find out how we can begin to remember the Story, share it, and go WIDE. 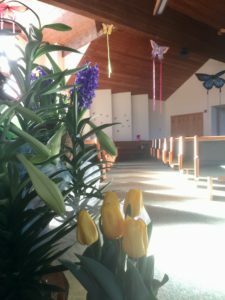 The sun burst over the Divide and pierced through the East windows, shining on the butterflies and warming the flowers up to waft the heavenly fragrance of hyacinth through the Sanctuary this morning. Easter Monday, 2018. Very early this morning I noticed that the sky was clear and we were in for a beautiful sunrise. Since I was already up and about, I headed into CEH because I wanted to watch what I had hoped for yesterday. The east windows of the sanctuary did not disappoint. The rising sun pierced through the Valley and burst into our sanctuary. What was even more beautiful was the way it illuminated our chancel area (see picture on bottom right). It’s quite unlike yesterday. Yesterday, on a grey April 1, Easter came in with more of a diffused glow. The Divide was thick in clouds and the snowfall limited visibility. The entire Valley had a thick covering of fog and really, the view out the East window looked more like a black and white Currier & Ives print than it did a sunrise. There was light, but we couldn’t see the source. I remembered the words of C.S. Lewis, “I believe in Christianity as I believe that the sun has risen: not only because I see it, but because by it I see everything else.” And so, even without seeing the sun, we saw the light — and we gathered tentatively, expectantly, and lifted our voices in song and praise. Our scripture reading was the Resurrection account from the gospel of John. In this version of the story the women head to the tomb and it’s empty, only the burial cloth is left in the tomb. Jesus was in the garden, but Mary didn’t recognize him (she thought him to be the gardener). But then Jesus said, “Mary” and she knew her teacher. So at sunrise service I challenged the worshipers to be willing to look at those who have “risen from the dead” and to look at them with “Resurrection Eyes” that expect and believe in transformation; not eyes that expect the same old same old. Because I think all too often we doubt the amazing transforming power of Jesus’ love and forgiveness. I’ve seen it time and time again in my pastoral care: someone bounces back (rises from the dead) from debilitating depression or sobers up (leaves the tomb) from addiction and even their family and friends do not recognize them or the change in their life and will not accept them as a new person. There are people I know who have been trapped in sin or doubt for years and have been set free by the forgiving and redeeming love of God through Jesus Christ, only to have their family and friends expect failure from them. Yes — those lilies are beginning to open their tight buds to trumpet the news of the resurrection to the world. 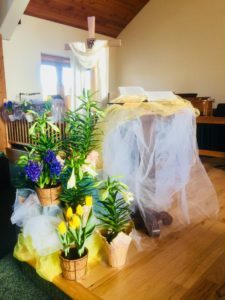 This morning, in the silence of the sanctuary at sunrise, I noted that our lilies (that had been shut tight yesterday) had begun to open in the sunlight; a poignant reminder that it’s never too late to open our eyes to transformation and change. Let’s expect transformation rather than failure — in ourselves and in those we encounter who have “Risen” from the dead. Eastertide lasts from yesterday, Resurrection Sunday, through Pentecost. 50 days. In direct contrast to giving up something for the 40 days of Lent, I encourage you to take on something new for the 50 days of Eastertide. What I want you to take on is the expectation of transformation. Watch all around you for marks of God’s transforming power over nature — the budding of the aspen, the early mountain flowers, perennials beginning to sprout after a long winter, snow melting into raging rivers that flow furiously and can transform the landscape by finding new paths down mountainsides. Because what we see and witness in creation is reflective of our Resurrecting God. We expect creation to break forth in new life; can we begin to expect new life through the transforming power of the resurrection? I pray we can, and we will, as we live into the promises witnessed so gloriously all around us.